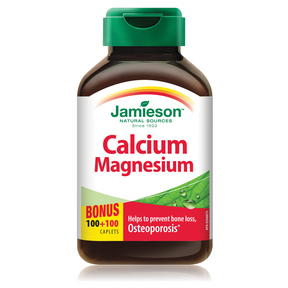 Jamieson Calcium Magnesium is a highly absorbable formula that combines calcium and magnesium at the optimal 2:1 ratio. It helps to support strong bones and healthy muscle function, and may help reduce the risk of developing osteoporosis. Non-medicinal ingredients: Cellulose, modified cellulose gum, vegetable distilled monoglycerides, vegetable stearic acid, vegetable magnesium stearate, silica, water-soluble cellulose, titanium dioxide, hydroxypropyl cellulose. NO salt (NaCl), gluten, lactose, shellfish, preservatives or artificial flavours. Consult a health care practitioner prior to use. Some people may experience diarrhea. Adults: Take 1 caplet three times daily with meals. Take a few hours before or after other medications.